Singha Park is a great place to spend a day in the outdoors for visitors coming up north to the beautiful Chiang Rai. Singha Park is a large expanse of land that has been converted into a tourist attraction that houses a range of animals as well as fruit orchards and tea plantations, zip lining adventures and farm tours. This expanse of land used to operate as a barley farm, before being reopened to the public in 2012 as a sustainable tourist park. Take the Farm Tour for the best view of this expansive property. Shuttles leave every half hour from 9.30am and you will be taken around the park, whilst a guide provides information about the plantations (in Thai). There are numerous stops along the way for visitors to get off and take photos of the picturesque grounds, as well as feed the many animals on site. The Shuttle Bus costs a low 50 THB per person. One of the most popular stops is the giraffe and zebra feeding enclosure where you can get off the shuttle to feed these amazing animals. A bunch of bananas is only 20 THB, so grab a bunch and feed the beautiful giraffes who will take the bananas right out of your hand! Another stop on the shuttle is at the souvenir shop, restaurant and zip lining adventure. At only 300 THB, this is one of the cheapest places to zipline in Thailand, and you will be rewarded with beautiful views of the grounds as you fly over the plantations. 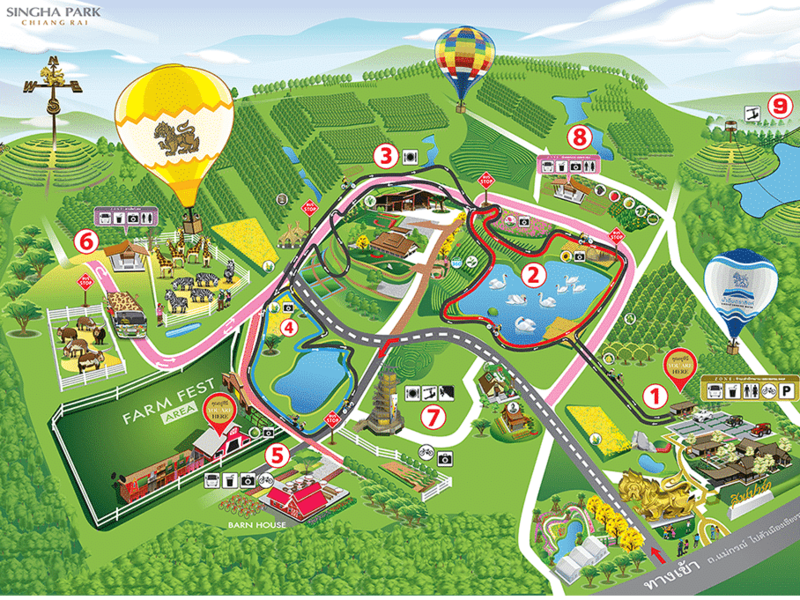 If you would like to take your time touring Singha Park, then hire a bike for 150 THB per hour. You can then pedal around the park at your own pace, the roads are sealed and suitable for bike riding. There are numerous cafes and restaurants located all around the park, and there is an information centre, bike hire, cafe, ticket office and toilets located at the front of the park. So come and visit Singha Park on your next visit to Chiang Rai, it is located just 5kms from the famous Wat Rong Khun (White Temple).